The Verdict: The 2016 Audi A8 is still an elegant, refined, thoroughly comfortable luxury flagship — but its onboard technology is overdue for an update. Versus the competition: Competitors have outpaced the A8 for technological advancement, but the Audi’s composure, luxurious appointments and dreamy-smooth powertrain continue to make it a satisfying luxury competitor. Approaching its final days in its current form, Audi’s A8 flagship is still an impressive beast. The stretched, all-wheel-drive, full-size luxury sedan from Volkswagen’s premium brand is due for a redesign, yet it’s a formidable competitor for buyers seeking a spacious, smooth and cocooning experience in their daily commute. Not much has changed for 2016 (compare it to the 2015 model here) aside from some new wheel designs, equipment packaging and interior colors. As of 2016, the only A8 available in the U.S. is the long-wheelbase A8 L. The short wheelbase carries on only in the sports-oriented S8. The Audi A8 features three possible powertrains: a 3.0-liter, turbocharged V-6; a 4.0-liter, turbocharged V-8; and a 6.3-liter, turbocharged W-12. The diesel TDI model available for 2015 has been dropped due to the TDI emissions issues. The Mercedes-Benz S-Class and BMW 7 Series body-types are fresher, and the Cadillac CT6 is considerably cheaper, so is there a reason to buy an A8 before it’s redesigned in the next year or two? It almost seems like a waste of time to discuss the styling of an Audi sedan; nothing has appreciably changed since 1996. The look is clean, with a sweeping arc roofline that’s been a major design element since it first showed up on an A4 nearly 20 years ago. The horse-collar grille arrived about 10 years later. There’s no mistaking the A8 for anything but an Audi; as I’ve said before, if you like the look of one model, you’ll likely enjoy all of them. I personally find the A8’s styling attractive and modern, and subtle adjustments to the headlights and taillights over the years have kept it from looking stale. The Audi A8 I tested had the midrange engine, a 4.0-liter, turbocharged V-8 making 450 horsepower and 444 pounds-feet of torque. Power runs through an eight-speed automatic transmission to all four wheels; Audi’s Quattro all-wheel-drive system is standard. The V-6 makes 333 hp and the much more expensive 6.3-liter W-12 makes 500 hp. If you like sport sedans, opt for the S8, which uses the same 4.0-liter V-8 but bumps power up to a whopping 605 hp. The A8’s 4.0-liter engine is plenty, however, with a manufacturer-estimated zero-to-60 mph time of just 4.4 seconds. It’s an easily believable figure given just how powerful the car feels under even moderate acceleration. Driven around town, the V-8 is calm, quiet and serene. Plant your foot on it, though, and the entire car seems to gather itself and burst forward on a surge of power that feels like surfing a gnarly Hawaiian wave. The power band is broad, and the compact V-8 never runs out of steam thanks to excellent tuning and the silky smooth operation of the eight-speed automatic. The drivetrain's versatility has to be one of the A8’s best features — athletic when you want it to be, quietly reserved and ready to be called upon at all other times. From a ride and suspension standpoint, the Audi A8 feels big and floaty. Its long wheelbase makes for a serene driving experience, insulated from the road and outside world — except when it comes to tire noise. There’s very little wind noise, but there’s a considerable amount of tire slap over expansion joints, joined by a hollow booming. The Audi Drive Select function allows you to adjust the steering, air suspension, transmission behavior and throttle response to make for a sportier experience, but even at its sportiest, the A8 is still a big, floaty car. If you want something more aggressive, opt for the tauter S8. The A8's driving experience matches up well with the Mercedes-Benz S-Class, even though the Audi's starting price is tens of thousands of dollars less. Both provide for a calm motoring experience, with rich cabins that coddle passengers, plus smooth, powerful engines. For a more performance-oriented experience than your flagship luxury car — but without opting for a smaller vehicle like the S8 — look to the BMW 7 Series or Cadillac CT6. Both provide the space and smoothness of the Audi A8 but with more aggressive handling characteristics. The CT6, with its extremely lightweight body and variety of powertrains, feels especially agile compared with the A8. Gas mileage for the Audi A8 4.0T is respectable, at an EPA-estimated 18/29/22 mpg city/highway/combined. My week with it returned about 25 mpg overall, beating the combined average. The competition is generally worse: The Mercedes-Benz S550 4Matic is rated 16/26/19 mpg, while the BMW 750i xDrive is rated 16/25/19 mpg. The all-wheel-drive Cadillac CT6, with its smaller twin-turbo V-6, is rated only 18/26/21 mpg, a surprisingly disappointing result given it’s a whopping 588 pounds lighter than the A8. The A8 is comfortable, front and back; there isn’t a bad seat in the house. Up front, occupants are treated to multi-adjustable power seats that aren’t quite the throne-like chairs seen in the S-Class but still provide support and comfort unparalleled in lesser sedans. Materials quality is top-notch, with Audi’s traditional attention to detail apparent in the operation and flow of everything from the door pulls to the window switches. There’s no touch-screen in here (aside from a small panel to input numbers and letters) and no blank panels that rely on haptic feedback bumps to register that your command has been received. This is what makes the A8 feel like it’s in another category from the touch-sensitive-control-cursed Cadillac CT6: The feedback you get from operating any control in the Audi A8 makes you feel justified in spending this much on a luxury car. It just feels expensive — something Cadillac, and to some extent BMW, have not been able to duplicate. The backseat is the premium spot, however, with the standard long-wheelbase A8 providing almost absurd levels of rear legroom. My test car also came equipped with a $2,500 Rear Seat Comfort Package, which powers the rear leather seats with recline, massage and ventilation features. A panoramic sunroof stretches between the front and rear seats, and the headliner is covered in Alcantara faux suede. The rear cabin surroundings are just as opulent as the front, with fine-grain ash wood, real metal and high-quality stitched Valcona diamond-stitched leather seats providing comfort for miles of travel, regardless of which seat you’re in. The Audi A8 has a standard multifunction controller and display for features and media. Standard navigation uses Google Earth for realism, but the A8's connectivity options fall short of competitors’. The A8 is limited to proprietary Apple smartphone connectors instead of having a standard USB port and my car even had Apple’s old 30-pin connector — you know, in case anyone who can afford a $100,000 luxury car is still using an iPhone now two generations out of date. Neither Apple CarPlay nor Android Auto are available, and there aren’t any USB charging ports for personal electronics anywhere in the interior. You’ll have to make do with a couple of 12-volt outlets and your own car-charger plugs. This might have been acceptable a couple of years ago, but it’s 2016; the latest $26,000 Chevrolet Malibu comes with four USB ports, four 12-volt sockets and even a 120-volt household three-prong outlet. It’s well past time for Audi to upgrade. The Audi A8's trunk is a bit small despite its stretch wheelbase: 14.2 cubic feet versus 18.2 in the 7 Series and 16.3 in the S-Class. The CT6 makes do with 15.3 cubic feet of cargo room. The A8’s rear seats don’t fold down because of the power reclining and massage functions, but a small pass-through is available as part of a Cold Weather Package (to accommodate skis, presumably). No crash-test ratings are available for the Audi A8. Despite being in need of a redesign, the A8 features quite a few electronic safety systems but, in typical German luxury-car fashion, nearly all of them are options. Standard in the A8 4.0T are blind spot warning, a backup camera, parking assist sensors and an around-view camera. The $2,250 Driver Assistance Package adds active lane keeping assist, adaptive cruise control and forward collision warning with automatic emergency braking. A head-up display is also standard and it includes a flashing red light if you happen to be following the car in front of you more closely than the A8 is comfortable with. In moderate-speed traffic, it was such an annoyance that I switched off the display more often than not. See all the A8’s standard features here. 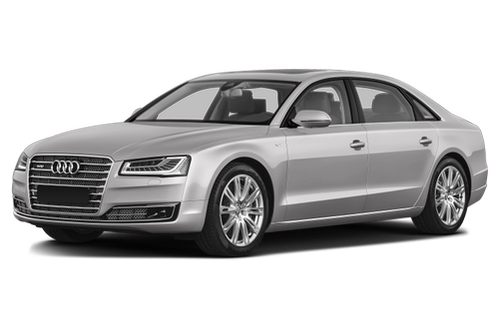 The 2016 Audi A8 L starts at $82,425 including destination fee. A 4.0T Sport starts at $91,425 and my test car had three option packages: Rear Seat Comfort (including power rear outboard seats with ventilation, massage and powered lumbar support), Driver Assistance (adaptive cruise control, active lane keeping and automatic high beams) and Cold Weather (multifunction heated steering wheel, heated rear seats and a rear-seat pass-through). Total as-tested came to $96,175. Competitors at the top of the luxury flagship field are well-known: The stalwart BMW 750i xDrive and Mercedes-Benz S550 4Matic are the best-matched alternatives to the Audi A8. The BMW features a twin-turbocharged V-8 engine, as well, but is rear-wheel-drive biased rather than having the front-wheel-drive platform the A8 sits on. The BMW is also more expensive, however, starting at $98,395 for an 750i xDrive, with options that can push it well over $130,000. The Mercedes-Benz S550 is similar, also featuring a twin-turbo V-8 and optional all-wheel drive. Its starting price of $99,575 can be pushed up over $145,000 with all of Mercedes’ fancy bells and whistles. A more cost-friendly option is the new Cadillac CT6, a 7 Series-sized sedan that weighs less than a 5 Series and forgoes the ubiquitous V-8 engine for a more modest (but still powerful) twin-turbo V-6. The CT6 starts at $65,390 and, even when you load it up with high-quality leather, a Panaray audio system and lots of automated safety features, it comes in just about where the other sedans start their base pricing. Compare all four vehicles here.